Play Lightning Horseman and you could win 1 of 4 in-play lightning jackpots. That’s just one reason to spin the latest Halloween fitting game. In this review of the spooky new slot from Lightning Box Games, we’re getting personal with the headless horseman himself. With multiple jackpots, lightning respins and a flippin’ retrigger, the Lightning Horseman slot is galloping around casinos now! If there’s anything we’ve learned about Lightning Box Games, it’s how much we like their style. There’s an old-school look and feel to these games and Lightning-Horseman follows suit. In this review, I’ll tell you what it’s all about, how the wins work and how much you can win. We’ll also look at the features in detail and break down the pay table for some real money win examples. Ok, let’s begin. 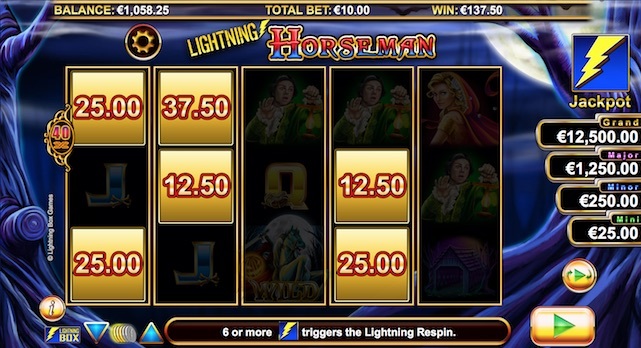 The Lightning Horseman Slot is a 5 reel, 40 payline horror-themed slot from Lightning Box Games. Based on the central character of the headless horseman, the game is a creepy spin-fest that uses lightning bolts at the centre of the action. 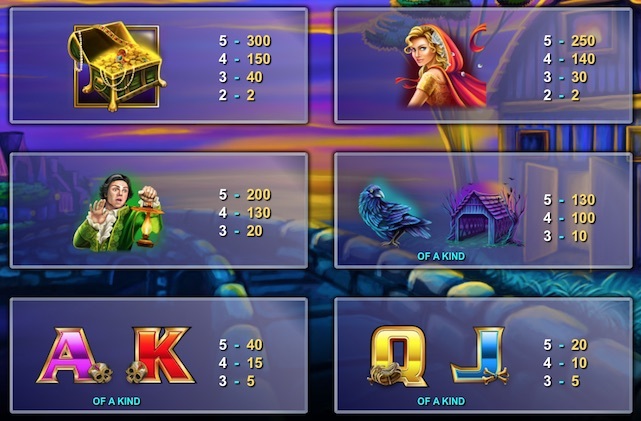 Review highlights for me include four lightning jackpots (ranging from mini to grand), a good betting range starting at 40p a spin and the slots overall spooky mood. Lightning Horseman will join new Halloween slots as the dark horse who’s rider has no head. While not the most graphical or engaging, Lightning-Horseman is compelling and potentially valuable. 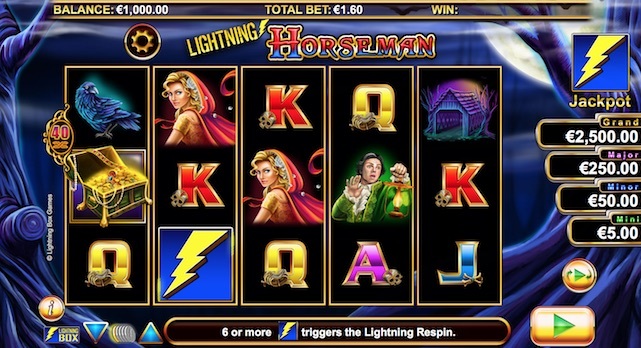 Playable from 40p to £50 a spin, the Lightning Horseman slot is available on desktop, mobile and tablet. Looking closer at the pay table, the highest paying symbol is the horseman wild at 600 x coins (5 of a kind) while the flippin’ retrigger looks like one of the games biggest payoffs. 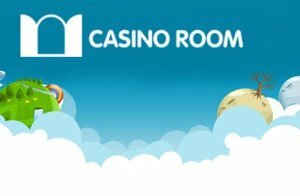 The slot has a payout rate of 95.52% RTP. It is thought that Lightning-Horseman is the first in a series of slots from Lightning Box games that uses these lightning bolt elements, so get in early! 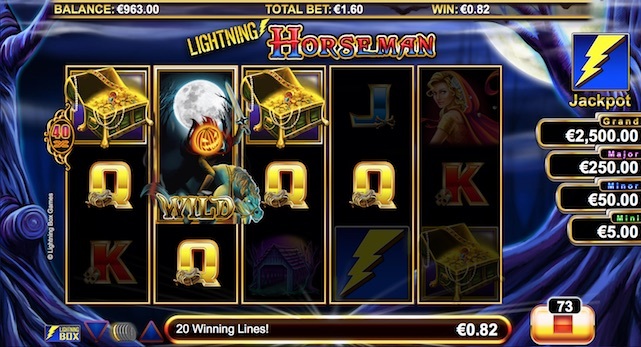 The Lightning Horseman slot features comprise of a wild symbol, lightning respin, flippin’ retrigger and lightning jackpots. There’s lots of electricity flying around and the general rule here is more lightning bolts mean more wins! A Wild Horseman symbol is a standard wild, though most new slots offer 500 x for this payout, this one is 600 x. It substitutes for all symbols except the lightning bolt, the games powerful scatter symbol. But as Wilds go, I like the headless horseman display that comes with it. Between 6 and 13 Lightning Bolt Symbols (Scatters) will activate the Lightning Respin feature. From what I gather, this is like a sticky wild element. 3 initial spins are awarded and all Lightning Bolts remain in place during the spins. If you get more Lightning Bolts, they’ll also stay in place and the re-spin count will reset to 3. On completion of the respins, all Lightning Bolts flip to reveal prizes. This can lead to huge cash wins and even one of the slots 4 jackpots. When I played the game, I hit and triggered the Lightning Respin while betting at £10 a spin. While I didn’t make it past the initial 3 respins (didn’t find any more lightning bolts) the feature returned £137.50 from six random cash prize rewards. On that, this is a very rewarding feature in bet/bonus ratio. I’d say this one of the Lightning Horseman slots best offers, but it’s also highly lucrative. Getting 15 lightning bolt symbols on the reels (every reel) at the same time is no easy feat. You’re in serious headless horseman territory here and taking him on, could cost lots of bets and even your own head. Well, not really, but you get the point, it’s a tough deal to chase and you’ll need lots of luck in that chase. A Flippin’ Retrigger is highly valuable and if you’re playing for real money, this is a definite game changer. It’s also another level up from the lightning respins game because that’s where you collect lightning bolts. All 15 lightning bolts are then re-flipped and each one offers a random cash prize, that’s 15 cash prizes in one hit! Unfortunately, I couldn’t hit this to prove how much you can win, and I guess until it happens, only the headless horseman knows the answer to that question. Developers Lightning Box do a wonderful job of lifting the base game with an additional bonus, in fact for bonuses. Lightning Jackpots are 4 cash sums (look at the right of the reels) ranging through mini, minor, major and grand. These jackpots are not progressive but are fixed to the amount at stake. For example, if playing at 40p a spin (lowest bet) mini = £5.00, minor = £50.00, major = £250.00 and grand = £2,500.00. At this level, that’s 6,250 x your betting stake for the grand lightning jackpot. Jackpots can be won randomly at the end of any Lightning Respin or Flippin’ Retrigger bonus. This means enormous winning potential for any player of Lightning Horseman. How much can you win playing Lightning Horseman Slot? Again with our online slot reviews, this is my favourite question. How much can you win? Because that’s what we really want to know. The amounts below are taken from the pay table (as coin values) and lightning jackpots in play for both 40p and £50.00 betting stakes. (Lowest and highest cost per spin in this game). If playing at 40p a spin, you might win £0.05 for 3 x card value symbols, £1.30 for 5 x ravens or £3.00 for 5 x treasure chests. The gorgeous cartoon damsel pays £2.50 for 5 of her. Lightning Jackpots at this level would pay mini £5.00, minor £50.00, major £250.00 and grand £2,500.00. The slots jackpot of 600 x coins for 5 x horseman symbols is £6.00 when playing at 40p a spin. Playing at £50 and we see the paytable values increase with the bet. At this level, we’re betting £1.25 on all 40 pay lines (£1.25 a coin). You would now win £18.75 for 4 x K symbols, £150.00 for 5 x creepy bridges, £250 for 5 x scared man with lantern or £750.00 for 5 of a kind headless horseman (wild). High rolling with £50 betting stakes would return lightning jackpots of mini £125.00, minor £1,250.00, major £6,250.00 and grand at £62,500.00. With glimpses of Sleepy Hollow and one of horror’s most iconic legends, Lightning Horseman rides smartly into the Halloween slots genre. I’ve read other slot reviews that slate the game’s graphics, but Lightning Box is all about the game’s engine. Other horror slot games might be ahead on graphics in front of this one, but Lightning Horseman doesn’t have a head. Instead, opting for multiple jackpots and lightning bolts of payout power. If you’re looking for a Halloween-themed horror slot that’s creepy, well animated and hugely rewarding (luck needed), Lightning Horseman will not disappoint. Look closely at this game and you’ll see a well-crafted slot fit for purpose, Halloween or otherwise.